After two years of research, relationship building and committee organizing, the Research Justice Center of the Coalition of Communities of Color (CCC) has released its first in-house report, “Leading with Race: Research Justice in Washington County” – a 374-page document outlining the racial inequalities that people of color experience on a daily basis. 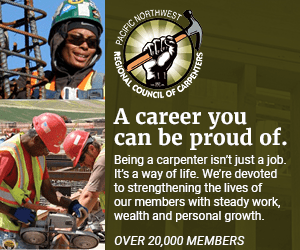 Although the CCC has worked primarily within Portland for the past 12 years, due to rapid gentrification, it turned to neighboring Washington County for current data. 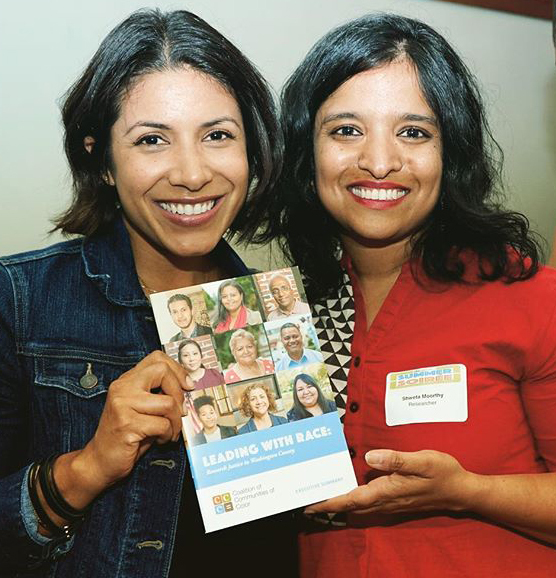 Shweta Moorthy (right), CCC Researcher, at the publication and release of “Leading with Race: Research Justice in Washington County.” (Courtesy of the Coalition of Communities of Color)“We knew that people were being pushed out of the Portland metropolitan area, and so we were grappling with the question of, how do we keep connected to the racial justice movement outside of Portland, where many people of color are now living,” Shweta Moorthy, researcher at CCC, told The Skanner. In many ways, “Leading with Race” is a companion report to CCC’s 2008 project, “An Unsettling Profile Research Series,” which gathered community-based research on the realities of communities of color in Multnomah County. “It had been a huge advocacy opportunity for culturally specific organizations and community members to really bust this myth that Portland is a color-blind, post-racial place – and to show the deep racial inequities that exist in the city,” said Moorthy. For “Leading the Race,” CCC looked west to Washington County – home to the largest population of people of color in Oregon – and recruited a 24-member steering committee comprised of community members, jurisdictional partners, the nonprofit sector, and culturally specific organizations. Home to Nike and Intel, Washington County is often perceived as Oregon’s most economically prosperous. Yet the report shows a different narrative – one where prosperity is not equitably experienced by communities of color. “Leading with Race” highlights the issues most relevant to people of color today, while breaking down common misconceptions and relaying the personal stories of its community members. Vietnamese and Filipino workers have lower incomes at similar levels of education as White workers. Black high-income home loan applicants are 86 percent more likely to have their application denied compared to their White counterparts; Latino applicants are 125 percent more likely. 68 percent of Native American single mothers with children are in poverty in Washington County, a higher rate compared to 48 percent of Native American single mothers in poverty in the US. In the section on African Americans in Washington County, “Leading with Race” found that while the Black community has grown by 36 percent from 2005 to 2015, only 2 percent of the total population is Black. Of that 2 percent, 44 percent are 18 years or younger. Even so, the outlook for Black youth is grim. First off, representation is scarce. No African American person has never held elected office in any jurisdiction in Washington County. In 2015, according to Oregon Department of Education, only 2 percent of public school teachers across all districts in the county identified as Black. Meanwhile, Black students in Washington County are 100 percent more likely to be expelled or suspended than White students. African Americans also have the highest incarceration rate of all the racial groups in the county – 662.3 people out of 100,000 were likely to be jailed compared to 190.5 White people. The poverty rate, too, among the Black community is more than double that of Whites in the county, with one of every five African American individuals living in poverty. “The impacts of racism and oppression over time in Washington County carry weight and burden,” said Justice Rajee at the report’s official release on June 18 in Beaverton. Rajee was one of several African American focus group participants during the report’s research. “This has to change and that we all have a part to play in making this change possible,” he continued. Over the next few months, the CCC and its steering members will be coordinating presentations across the county to discuss the report’s findings. Its hope is to create specific partnerships that can drive racial justice and policy changes, and in-turn, improve daily realities for communities of color.